The influence maximization (IM) problem seeks a set of seed nodes in a network to maximize the expected number of nodes activated via an influence cascade initiated at that seed set. A previous post compared two IM algorithms - the Greedy algorithm of Kempe et al. (2003) and the CELF algorithm of Leskovec et al. (2007). For years, CELF (and its modified CELF++ version by Goyal et al. 2011) were the fastest IM algorithms with theoretically guaranteed performance bounds. The subsequent literature focussed largely on improving computational efficiency with heuristics that sacrificed theoretical guarantees in favor of speed. More recently, however, a new approach to the problem - Reverse Influence Sampling (RIS) - has emerged which is both fast and theoretically guaranteed, and is now one of the state-of-the-art IM methods. This post walks through an implementation of the RIS algorithm in Python and compares its solutions and computational speed to the CELF algorithm described in the previous post. The key insight enabling the RIS family of algorithms is the concept of a random reverse reachable set introduced to the IM problem by Borgs et al. (2014). A reverse reachable (RR) set for an arbitrary node $v$ is generated by first sampling a graph $g$ from the distribution generated by removing each edge $e$ according to its propagation probability $1-p_e$ and then taking the set of nodes in $g$ that can “reach” $v$. A random reverse reachable (RRR) set is simply a RR set for a node selected uniformly at random. A visual example is presented below. Edges are sampled from the original network $G$ on the left according to each edge’s assigned probability (the code in this post assumes that all edges share the same propagation probability so that $p_e=p$). This produces a sampled network $g$ in the middle figure, in which the edges with high probability tend to be picked. A random node D is selected and the resulting RRR set consists of those nodes with a directed path to D, which are surrounded by dashed lines. Generate a set $R$ of many independent RRR sets. Select $k$ nodes to cover the maximum number of RRR sets in R using the standard greedy algorithm, which obtains a $(1-1/e-\epsilon)$-approximate solution to the problem. This approach works because for any seed set $S$, the fraction of RRR sets in $R$ covered by $S$ is an unbiased estimator of the spread of $S$ (due to the lemma described above). Therefore, a seed set that covers a large number of RR sets in $R$ is likely to have a large expected influence, which makes it a good solution to the IM problem. The key to the very high computational performance of the RIS algorithm is that, unlike Greedy or CELF, it doesn’t repeat the spread computation procedure to incrementally construct a solution. Instead, it performs all the Monte Carlo simulations/sampling up front to construct $R$, from which it then selects the entire seed set. The method therefore avoids the “wasted” spread computations of the greedy algorithm and most of its successors because the generated RRR sets are used to inform the spread of all nodes within the network. Randomly select the source node from the set of all potential source nodes contained in the source column of G.
Sample an instance g from the network G by comparing the propagation parameter p with a uniform random draw to simulate the sampling procedure for each edge, and extract those edges that remain into a new dataframe that represents the sampled graph. This is very similar to the method used in the IC() function below to simulate a propagation, which hints at why RIS works. Produce the RR set itself through an iterative procedure that first finds all nodes with edges leading into source, which are then added to the RRS list object. The loop then finds all the nodes with edges leading into the new nodes found in the previous step and so on. The dataframe representation of the network makes this process very easy because we simply filter based on the target column and then select “new nodes” from the source column. Alternative representations would require some form of neighboring function. Generate a large collection R of mc random reverse reachable sets by looping over the get_RRS() function. Run the “maximum greedy coverage” algorithm which simply finds the node that appears in the most RRR sets. Once this is found, the RRR sets featuring that node are removed from the collection R, and the process is repeated until k nodes are chosen and stored in the list object SEED. Along the way we also keep track of the time, which we compare with the CELF running time below. Below, is the independent cascade propagation function IC(), which calculates the spread for a given seed set within a network, and the celf() function, which takes a network and finds the most influential nodes using the CELF algorithm. For a more detailed explanation of these functions, please see this previous post. Note, however, that these functions differ slightly because they use the same dataframe representation of the network in the functions described above (instead of the igraph representation in the previous post). We’ll first test the RIS algorithm to see if it can identify the correct solution to a simple toy example for which we know the two most influential nodes. Below we create a 10-node/20-edge directed network in which nodes 0 and 1 are the most influential. We do this by creating 8 links outgoing from 0 and 1 compared to a maximum of one from the other 8 nodes. We also make sure that 0 and 1 are not neighbors so that having one in the seed set does not make the inclusion of the other redundant. Plotting the network allows us to gain some visual intuition as to why nodes 0 and 1 are the most influential. gr.vs["label"], gr.es["color"], gr.vs["color"] = range(10), "#B3CDE3", "#FBB4AE"
Running each of the algorithms on this graph to find the most influential seed set of size $k=2$ successfully obtains the two nodes (the choice of p and mc doesn’t really matter here). We now step away from our toy example to consider a larger 100-node network. Instead of directly specifying the network like above, we’ll use the Barabasi method from the igraph package to automatically construct a network created through the Albert-Barabasi preferential attachment method which approximates a scale-free network. The choice of graph type is arbitrary and doesn’t matter as the main points hold for any graph. We convert the network into our dataframe representation by looping over each edge and extracting the source and target nodes. Plotting the network shows that we’re now dealing with a larger more complicated graph in which the influential nodes are not obvious. G.es["color"], G.vs["color"] = "#B3CDE3", "#FBB4AE"
Unlike the comparison of the Greedy and CELF algorithms in the previous post, and unlike the results from our toy example above, there is no theoretical guarantee that the CELF and RIS approaches should yield identical results for a finite number of Monte Carlo simulations/RRS sets. The only guarantee is that both algorithms yield a seed set that achieves a spread within $(1-1/e-\epsilon)$ of the optimal achievable spread with a given probability, but those sets may be different. It is worth taking the time here to discuss the difference between the mc parameter in each method, and how they relate to the error term $\epsilon$ in the approximation. In CELF, mc specifies how many different propagation cascades are run to calculate the mean spread of each node under consideration. In RIS, mc instead dictates the size of the collection of RRS sets R. Setting the same value of mc for each method will therefore not usually achieve the same level of accuracy $\epsilon$. Now the trouble with these expressions is that $OPT$ is generally unknown (because we need to know the thing we’re solving for in order to compute it!). So in practice, the literature attempts to come up with a lower bound for $OPT$, which in turn implies an upper bound for the expression above and therefore a conservative estimate on what to set mc in order to achieve a given $\epsilon$. A super conservative estimate would we to set $OPT=k$, which effectively assumes that the seed set only activates itself. But this means that we create too many RRS sets or run too many Monte Carlo simulations, so we ideally want a better estimate/tighter lower bound. But to make things even more tricky, it turns out that figuring out a tighter lower-bound is itself a computationally intensive process so there tends to be a trade-off between wanting to create fewer RRSs and not wanting to waste computational resources figuring out an optimal level of $OPT$ that is required to justify fewer RRSs. Much of the recent literature has been dedicated to exactly this issue (see Tang et al. (2014), Tang et al. (2015), Nguyen et al. (2016), and Huang et al. (2017) among others). We won’t get into these complexities in this post, other than to acknowledge that they exist. From here on we’ll just set large mc values and hope they achieve approximately the same $\epsilon$. The graph below compares the speed of the two algorithms as the size of the seed set grows. The most obvious point is that the RIS algorithm is much faster (by about an order of magnitude). 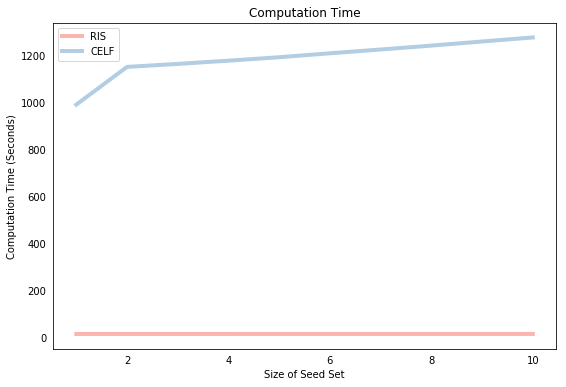 The other feature of the plot is that the CELF computation time grows somewhat proportionately with the size of the seed set (although not quite, see the previous post to understand why), whereas the RIS algorithm time stays pretty much constant with respect to the size of the seed set. This is because the CELF algorithm must compute the marginal gain for a given potential seed node in each round of the iteration procedure. 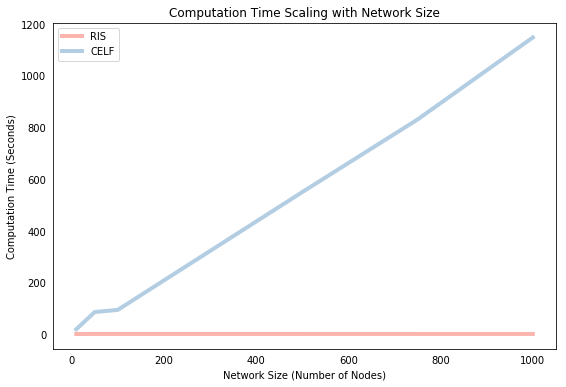 In contrast, RIS performs all simulations “up front” so that the only cost to expanding the seed set is the “search cost” of finding the node that appears most frequently in a list, which is a relatively cheap computational exercise. As mentioned, the only guarantee is that both approaches will yield solutions that achieve at least $(1-1/e-\epsilon) \approx $ 63% of the optimal spread, which leaves a significant amount of room for the approaches to produce different solutions. To the best of my knowledge, there hasn’t been a systematic comparison of the methods to find which approach achieves a superior spread, empirically, and under which conditions. Below, we first print the resulting seed sets from each method, which differ but show some overlap. We then run each of the seed sets through an IC propagation function, which shows that they also achieve approximately the same spread. In our particular example above, the RIS spread was slightly higher, but this is due to randomness. If we repeated that same analysis the “best” method would change, but would stay around the 13.3 region. The speed comparison above showed how each algorithm scales with respect to the size of the seed set. We’ll conclude by showing how they scale with respect to network size. Below, we solve each algorithm for a selection of different network sizes (with some parameters tweaked to save time) and plot the computation time against the number of nodes in the network. Again, we find that CELF scales approximately linearly with network size whereas RIS is almost indifferent to network size in these small scales. Both algorithms result in similar seed sets and influence spread. The RIS algorithm runs a lot faster and scales much better with network size and seed set size. The source code for this post is available at its Github repository.